Shoppers who fill their supermarket trolleys with special offers on food and drink have more than a 50% increased chance of being obese, according to the new Paying the Price report from Children's Food Campaign member Cancer Research UK. 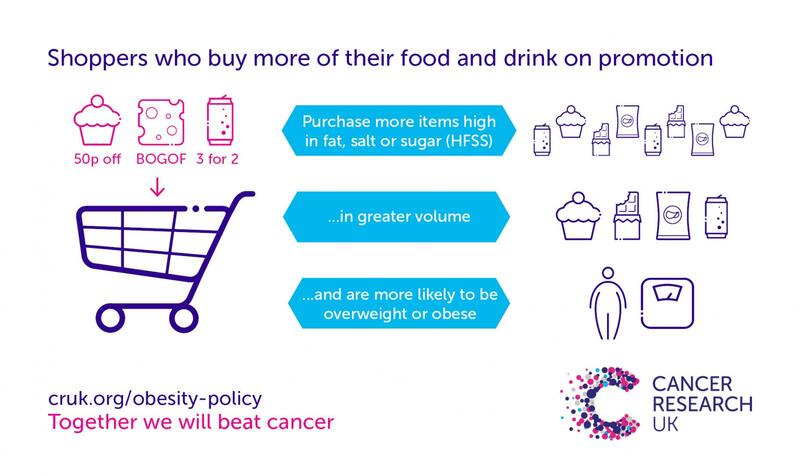 The new Cancer Research UK report, Paying the Price, which is based on shopping data from more than 16,000 British households, found that people whose shopping baskets contained around 40-80% of goods on special offer are more likely to be overweight or obese. The research also found that almost half of all chocolate, crisps, popcorn, and savoury snacks were bought on promotion. Bargain-loving shoppers bought 30% less fruit, and nearly 25% fewer vegetables. The people who purchased the most items on offer bought 25% more food and drink high in fat, salt or sugar, equating to approximately 11 extra unhealthy items a month, per typical household of 2 adults and 2 children. The study reveals that average levels of obesity were 30% higher among people from households which bought the most food and drink on special promotions compared to those who bought the least. Obesity is associated with increased risk of 13 different types of cancer, including bowel, kidney, liver, pancreatic and breast cancers. The study drew on shopping data from 16,148 households from Kantar Worldpanel. The Government is currently running a public consultation on introducing restrictions for certain types of promotion of foods that are high in fat, salt and sugar (HFSS), including those that encourage multiple purchases (eg. 3 for the price of 2, or 3 for £5), and also displays of these products in prominent locations in store entrances, aisle ends and checkout areas (and their equivalent online). The consultation is open until 6 April 2019.